If you are one of those people then this article is for you. 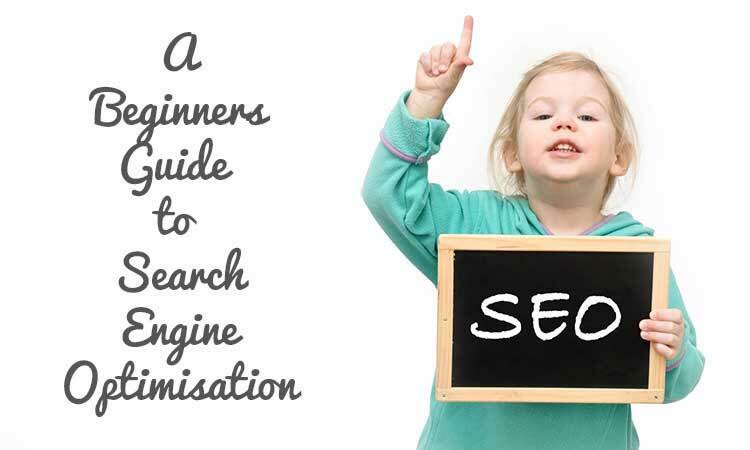 This article is Search Engine Optimisation for beginners and is a great guide if you aren’t sure where to start with SEO. 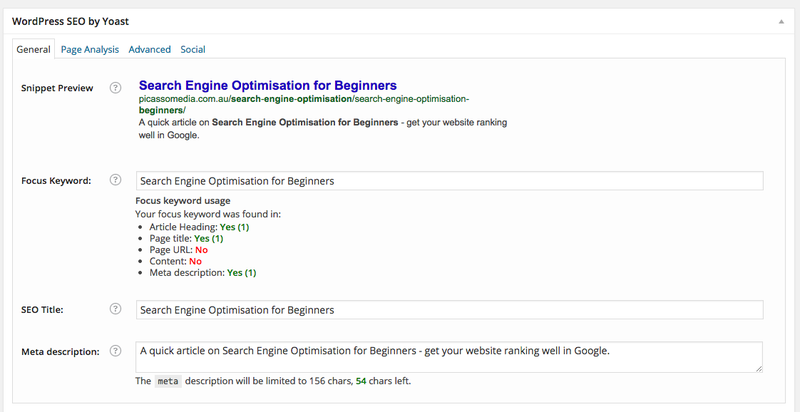 So what is Search Engine Optimisation? It is the process used for getting your website ready for Google. If you run a business then you can’t afford to ignore Google (the number one search engine globally). There are two ways for your website to appear in Google. One is through paid advertising like adwords and the second is through the natural search results. The ads appear at the top and in the sidebar and they show the icon AD next to them. This indicates that the company are paying for that ad spot. The ones that are further down are the natural results and Google organises these results based on relevance. Basically you are going to be showing Google that you are relevant for your business topic or keyword. The aim of the game is to get onto the first page of the search results. Those companies who are take the top spot generate a huge amount of traffic to their website. I know that might all sounds confusing but I promise by the end of the article it will all make more sense. SEO doesn’t have to be complicated and it just takes a little thought and common sense. One of the most crucial parts of your Search Engine Optimisation work is your keyword research. It is one of the biggest things we work on when we start on an SEO campaign. However, it doesn’t have to be that complicated – a little common sense and your website can be ranking up with the best of them. Ideally what you want to do is choose one keyword per page. 1. The first think you need is a Google account. If you don’t have one then follow this tutorial. 2. 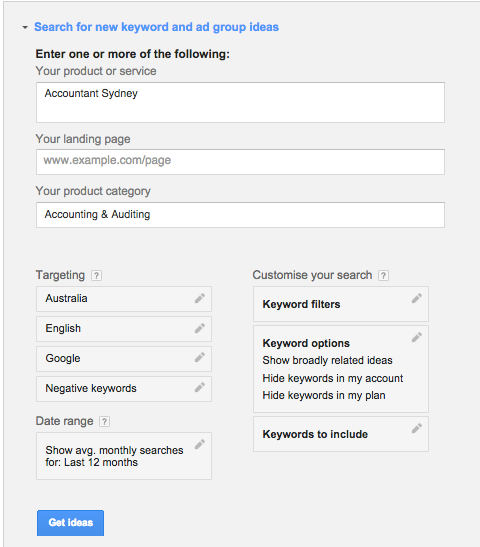 Sign into Google Adwords with your Google account. You want to use the keyword planner tool. 4. If you are an accountant in Sydney you would put that into the product/service area, along with filling in the rest of the information. 5. 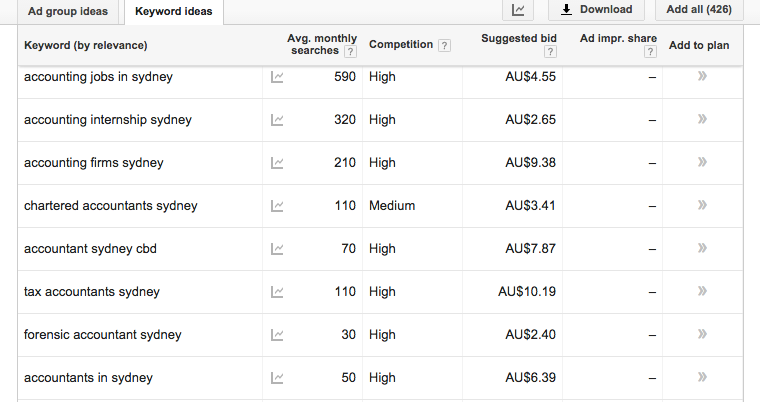 Once you click the Get Ideas then it will bring up the Keyword Ideas relevant to your business search. 6. You want to short list keyword ideas that you ideally would like to rank for. These will become the basis for the on page SEO you will do. So now you have a list of keywords. You need to choose those that are relevant to your business (and suitable to your pages). Choose longer keywords rather than a one word keyword. 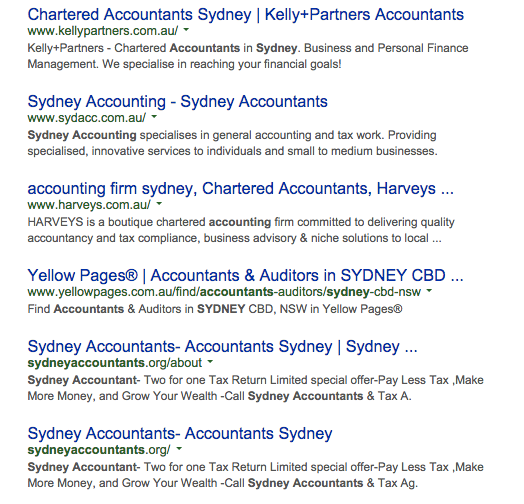 For example tax accountant sydney cbd is much better than the simple ‘accountant‘. The longer the keyword the less competition, which means you will rank easier than the higher competition words. Ideally you want to focus on one keyword per page, this is the recommended technique from Google. Before you begin this work I recommend installing the Yoast SEO plugin for WordPress to your website. Input your keyword into the focus keyword section. Remember we only want to focus on one keyword per page. Then I want you to review your wording throughout the page, are there places where you can input your keyword strategically? The key to this is to ensure the wording reads well and don’t put it in too many times. Google looks for this and will penalise if you use the word too much. Quite simply meta-tags are the things that tells Google what your page is about. You can tell Google exactly what you want this to say by editing your meta-tags. If you are using WordPress you will need to have the Yoast SEO plugin for WordPress installed on your website. For each of your pages you want to choose one of your keywords to focus on. To edit your meta-tag you can edit your page then scroll down to your Yoast settings. You want to ensure you put your keyword your SEO Title section (this is the most important). This is how you will tell Google about your page. You can then complete your Meta description with some wording on what the page is about, write this with people in mind rather than Google but it is a great idea to include your keyword again. See my example for this page. 1. Do your keyword research and choose the keywords relevant to your business/website/pages on your site. 2. Go through each of those pages and edit your content (wording) so that you are using your keyword. Remember go with one keyword per page. 3. Set up your meta-tags on each page whilst you are there to match your keyword. 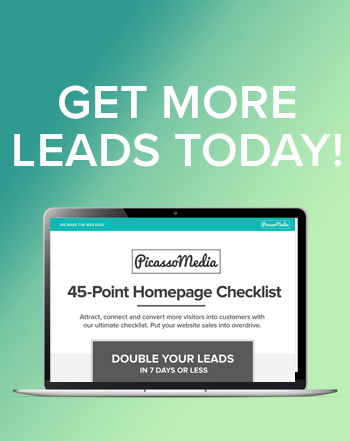 Download our keyword template so you can track your pages and keywords. 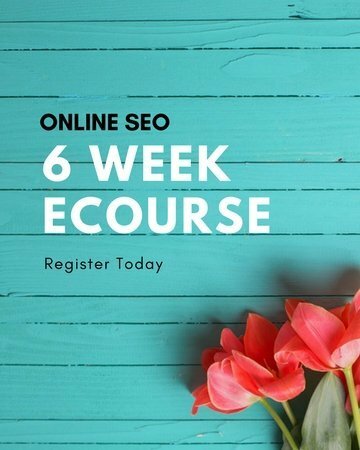 Look out next week for more tips on SEO for your business. If you need help with your Search Engine Optimisation then send us an email to see how we can help you.